A 68-year-old woman was jailed but later released Saturday after she plowed an SUV through a house in Washington, killing her partner and injuring her daughter and son-in-law, police said. The woman was booked on one count of vehicular homicide and two counts of vehicular assault, but released within hours pending an investigation, King County Sgt. DB Gates told NBC affiliate King 5. The Jeep the woman was driving shot through the lakeside home on Friday night, killing a 70-year-old man inside and critically injuring the woman's daughter and son-in-law, who were outside on the deck. 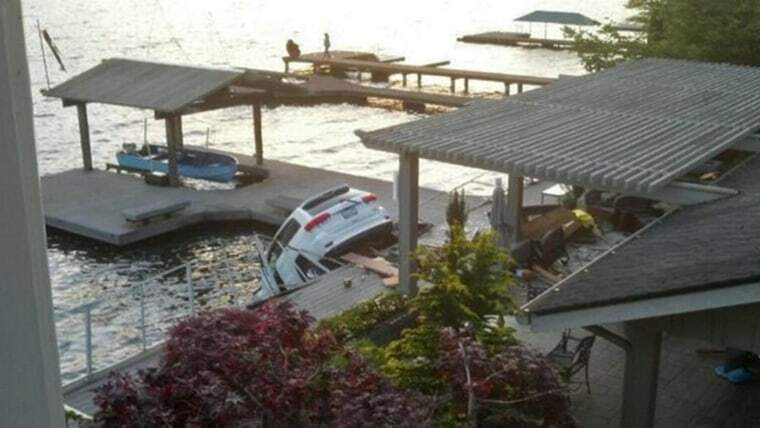 Even though the vehicle ended up partially submerged into Lake Sammamish, the woman and her 3-year-old grandson in the SUV were uninjured. Detectives found probable cause of impairment after the accident, but Gates said toxicology reports were still pending, King 5 reported. One woman was detained on vehicular homicide and assault counts on Saturday, according to King County Jail Records. That woman was detained at 1:43 a.m. Saturday and released at 7:56 p.m., records show. Gates said investigators are trying to reconstruct what caused the fatal accident. Neighbor Kevin Connelly told King 5 that the woman was "just moving the car" when it "shot forward through the house."